[insert Christmas song now]…You better watch out, you better not cry, you better not shout for Shiloh I’m telling you why, the Jo-Jo Pitts are coming to town (minus Shiloh….again). They leave when Shiloh’s sleeping, they come back when she’s awake. They know if you’ve been bad or good, so be good for Shiloh’s sake! Yeah, that was much better sung in my head than typed out. Oh well. 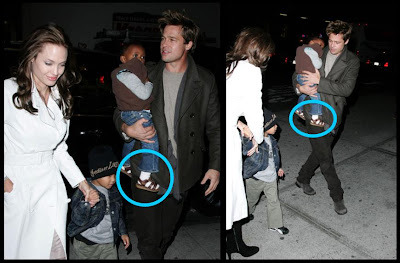 Anyway, the Jolie-Pitts arrived in New York and while 3 out of 4 of them are dressed in their Sunday best, they decided to dress one of them in typical New York tourist fashion…..dress socks and sandals. I mean, the only thing that was missing from that outfit was a camera around Zahara’s neck and a life-sized map tucked under her arm. Oh yeah, and also add the thought if she got into a car, drove 5 miles an hour, and then crashed. Now THAT’s the type of New York tourist I’m talking about! P.S, I got an extra 5 points for hitting 5 stereotypes in one post. I think I win something. Perhaps a lawsuit? The Jolie-Pitts were in the small apple to help support Mother Angelina promote her new movie, “The Good Shepard” or as the kids like to call it, “#1 in the box office = new brothers and sisters to buy.” It has a nice ring to it, doesn’t it?